Nickel is a survivor. He has to be. For as long as he can remember, his life has hinged on the flip of a coin. Or, rather, the scribble of a social worker’s pen. He’s been through the system, even had a good dad for a few years, until he was gone, too. But Nickel remembers everything he taught him, and since the day he escaped from foster-care hell, he’s put that knowledge to good use. Just twelve years old, he makes a steady living by selling marijuana to high schoolers, blackmailing pedophiles he ferrets out online, and working as a private investigator. When a beautiful girl named Arrow hires him to find her little sister Shelby, Nickel figures at best the kid’s a runaway; at worst, some perv’s gotten a hold of her. He scours the internet and the streets of Arrow’s suburban neighborhood, and what he finds there is as ugly a truth as he’s ever seen. For beyond the manicured lawns, Nickel discovers children for sale, and adults with souls black as the devil. And people like that aren’t about to let some kid ruin their game. This edgy thriller introduces a canny, precocious anti-hero, the likes of which young-adult readers have never seen. Why I read this: It came up as a Teen Book Scene tour and it sounded like a cool read. :) Something definitely different from what I usually read. Plot: Nickel is his alias, and he runs all sorts of scams to hurt the pedophiles in this world. You find out quickly, how jaded Nickel is, but he can't even resist his hormones when he meets Arrow and falls in love. He takes on her case of a missing sister for free and finds himself entangled in a case that proves dangerous and worth all the risks. I love the realistic edge this book has, the way that the reader can just feel Nickel for everything he has. He's brilliant in a way that really opens your eyes to the realism he sees and that exists around us. This plot definitely moved - there were some side jobs, but the book focused on Arrow and her need to find her sister Shelby. There's a great scene in the book that I promise not to give too much away about but there's a shootout at some point and it just reminded me of a scene from a movie, that's how well it was written. And I think I actually hollered during the scene because it was so good and kept you on the edge. It was also a "YES" moment, in a good way - I can't explain it. You need to go out and buy the book and read it and you'll know exactly what I mean. So good. I seriously think this is the best book I've read all year and will be the best book of the year for me, no doubt. 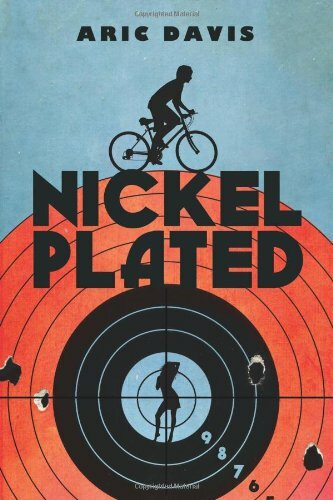 Now, I just hope that Aric Davis will write a brilliant second novel featuring the young and awesome Nickel, for I need to see more of his adventures. Characters: Nickel was a totally killer character. Someone wrote that he was a bit like Artemis Fowl, but I can't completely agree. He's definitely an anti-hero, a kid who you'd probably pass by on the street and think nothing of. But he's incredibly cunning, filled with this amazing ambition to put away pedophiles for good, even if it costs him his life doing it. And he has all the street-smarts as well. He knows even when he has to grocery shop, he has to act like a normal kid again. He has precise methods to what he does and how he does it and he is the least kid-like kid I've ever read in a novel. Definitely a jaded and adult-like character, but Nickel still has a bit of innocence in him and that comes out when he is with Arrow. Arrow is also an incredible character. Someone who is sure of herself and is genuine with Nickel, more than I think you understand from his point of view. She's beautiful and determined and doesn't hesitate to do what she needs in order to get her sister back. And I love all of the characters. Especially Eyepatch, the random guy who sits at the park each day and Rhino, a man who runs a gym that teaches people to fight and believes in Nickel more than anyone else in the novel - even if he doesn't outright show it. And even Lou, the driver is an interesting character. All of the characters in this book pop out at you and come to life. I'll say it again, you need to go and buy this book now. Relatability: For anyone who hates pedophiles, loves anti-heros, and can deal with the nitty-gritty realism of life - this is a book for you. Cover Commentary: Not the best, at least there's a kid with a bike on it. Seems a little retro for me. But, don't judge a book by its cover, eh? Just buy it already! This book rocks. I've been enjoying reading books lately with male perspectives. It's rather entertaining. This sounds really promising. It looks like a different type of story which I am always looking for. This book sounds like just the change of pace for me. I have been reading a lot of books with similar plots and premises...it will be nice to try something so different! I've been so curious about this, and I'm so glad it sounds worth giving it a try. I love anti-heroes. Wow! This book sounds really intense. I'm glad to hear that you enjoyed it. I will definitely keep an eye out for more reviews... This sounds like something I might enjoy. The book sounds like a great read for teens, I read the review and think my nephew would love this book, I hope to win a copy for him. You wrote a great review and I appreicate it! my favorite thing EVER in books is a clever, snarky, and slightly nerdy male lead. pair that with solid writing, and i am HOOKED. thanks for the review and the contest! This looks like an interesting read! I have heard of the book and now that I've read your review and have seen your rating,I will definitely try to read it! Wow. I hate to say it, but when this popped up in my Reader feed, I skipped it based on the cover. It looked a little blah and somehow too 'pop' and meh. (I judge by covers, I can't help it.) I NEVER would have guessed from the cover that it was about any of this, or had all this darker stuff going on in it, that actually sounds really interesting. And I am a fan of anti-hero stories -- if they're done well. Think I might actually have to pick this one up now. This book sounds really interesting and so different from the type of books I've been reading lately. I have to add this one to my wish list now! Thanks for the review and the giveaway. I enjoyed your review. I love reading mysteries, and this sounds really good. Thanks for having this giveaway.